I have just returned from a 2 week holiday from Glasgow to Orlando with the BabyZen YoYo and thought I would share my experience for others. The BabyZen YoYo was expensive but it was worth every penny! We added on a Masters golf dual strap which was about £8 on Ebay so that the YoYo could be carried like a rucksack. When we got to check in I had to show/prove to several different check in staff that the YoYo did in-fact fold and comply with the size requirements for hand baggage. I had expected this and had emailed Virgin beforehand to ensure I had written confirmation that I could take this new buggy on board the aircraft as hand baggage as it is compliant with IATA standards for cabin luggage. I didn’t expect ground staff to be in the know about such a new pushchair. Even once it had the ‘accepted for cabin baggage tag’ on it a different member of staff noticed it and tried to take it off thinking it was a mistake and I had to go through it all again. I am now a whizz at demonstrating it! It was a pain – but obviously it is a new product and looking at the YoYo you wouldn’t think/believe it folds down so small so I understand staff questioning it. Luckily I was pushing my eldest around in it who didn’t need to be fastened in so it was easy enough for her to stand while I quickly folded it to prove its size but it would have definitely have been more of a problem if it had been my youngest who would have needed fastening, unfastening, and protesting to going in and out. This may not be a continuing problem but I thought I should mention it so others are aware it may happen. Once past check-in this side it was never questioned again. Having to show it a few times in action was more than worth it for being allowed it onboard the aircraft. The airport is bigger than you think, with a lot of walking and waiting and I was glad of the pushchairs. When we got to the gate (the furthest away one, of course!) I dismantled the BJCM4 and put it in the travel bag quickly and staff took it to the hold while I put my youngest into the YoYo while we waited in the queue for passports and boarding passes to be checked and then pushed him down right to the plane door, took my son out, quickly and easily folded the YoYo and boarded. Unfortunately I was unable to take any clear photos of the YoYo on the plane on the way there, with a plane full of people, 2 kids and so many bags trying to store I never got the chance to try and retake them. The YoYo comfortably fits in the overhead lockers. It fits onto the chair, or floor before stowing away but does not fit under the seat in front. After 9 difficult hours flying with 2 children who didn’t sleep the entire time, my son eventually decided to fall asleep while descending. When we finally landed at Orlando International Airport we had one unhappy, sleepy baby on our hands. As soon as we had disembarked the plane the BabyZen YoYo came into its own and became worth its weight in gold! We unfolded, reclined, harnessed our sleepy son into it and off we went easily pushing it through the massive airport to immigration. It was great. My son could peacefully be in his pushchair while we waited for what seemed like an eternity at immigration. I felt bad for the other families who looked on enviously and questioned how I had got my pushchair and why I was allowed when they clearly hadn’t. We struggled enough with our tired 3 year old, 3 x hand luggage, a handbag while juggling passports and immigration cards! With all this it was a lot easier to push a pushchair than carry a struggling, screaming, over-tired baby as well as all the other things. After eventually clearing immigration we had to wait on our luggage and by this point our daughter was flagging. Our other pushchair finally appeared from the hold (they did not come out quickly, or first) and I wished I had just bought 2 BabyZen YoYo! I think it is worth noting that the BabyZen YoYo small folding size is not only great for the aircraft cabin but it is ideal for hire car boots which are also filled with what could easily be 4 suitcases, 4 hand baggage, a hand bag, car seats and pushchairs for a family of 4. We stayed at the Disney Boardwalk and a short time at Disney Old Key West and used their courtesy bus service to the parks daily. It is a legal requirement that pushchairs are folded to get on the bus. As we had a Baby Jogger and YoYo, both were great for quickly and easily folding but the YoYo was much easier for carrying and storing while on the (sometimes crowded) bus as it could free stand and be popped under the seat or in the small baggage storage on some of the buses. The BJCM4 did have the automatic lock but it doesn’t free stand and was bulkier and more awkward to keep a hold of with 2 kids, a day bag and other people, kids and pushchairs around. Restaurants also require no pushchair access (unless baby is sleeping it seemed) so the norm is to leave your pushchair in the unsupervised stroller parking. I kind of felt rather uneasy about leaving my expensive pushchairs unattended so it was great to be able to take the YoYo out with us to a restaurant and fold it to its tiny size which meant it could be taken inside and placed, safely out of the way under the table. It was easy to push on the different terrains through the Disney Parks and glides through the malls. The hood – as good as the YoYo hood is in comparison to some pushchairs it wasn’t a patch on the BJCM hood and really wasn’t substantial enough for the 91° heat and Florida sunshine. The raincover – worse than useless. Doesn’t fold so cannot be stored easily anywhere on the buggy and is so flimsy it definitely didn’t cope with Flordia downpours. The seat – the YoYo seat is quite slouched which may be a problem for some but didn’t affect my two as much as I had thought it would. When strapped in if my son jolted forward he took the seat with him. It almost pulls it into a bold upright position. Not dangerous as he remained strapped in and couldn’t do anything/go anywhere but again I thought it was something to mention. The Velcro straps – the straps that attach the seat fabric to the frame on the pushchair started peel apart whenever my kids were in it. Maybe it was them wriggling about so much but every time I fixed it, it wasn’t long before it had unattached again. It is not vital these parts are together it appears as it is just keeping the soft seat fabric onto the frame but it wasn’t aesthetically pleasing and it became annoying fixing it so often. Not a major problem, but again something I thought I should note. The fortnight flew by (unfortunately) and it was soon time to head back to the airport for our return flight. The check-in staff didn’t question when I said the YoYo could go on as hand luggage. When I got up to the gate it confused them when they asked did I require 2 pushchair labels but I said no only one as the other one could go onboard. But again, when I folded it and they quickly permitted it and I decided just to carry it on from there. A much quicker 7 hours 40 minutes later we landed in Glasgow Airport and again the YoYo proved its worth while we pushed our youngest from the furthest part of the airport to immigration, through the long queue and wait for the luggage and other pushchair to appear. 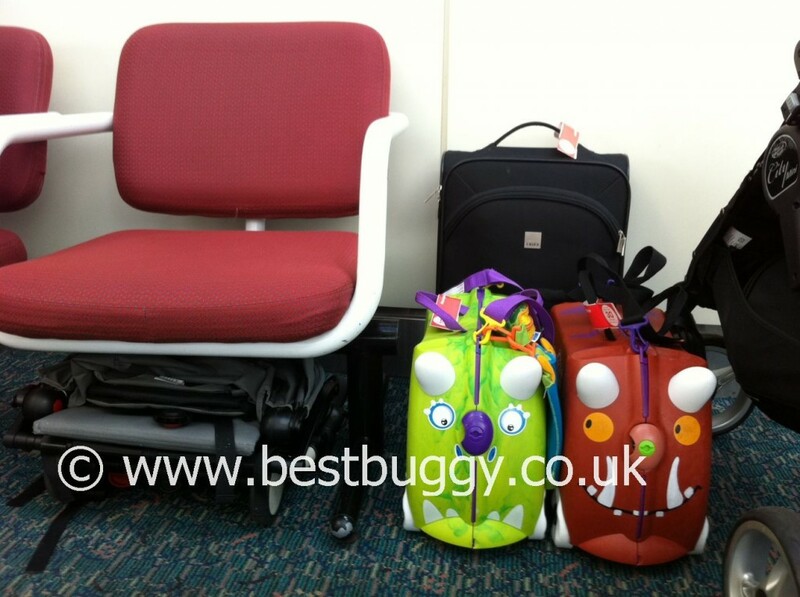 I can say that pushchairs from the hold definitely do not come out first, nor quickly as we had our other baggage before it eventually appeared so I was very, very glad that we had purchased the YoYo for this reason. The BabyZen YoYo is very expensive, but for us, being able to take it onboard the aircraft which enabled us to be able use it as soon as we were off at the other end and through the airport was worth every penny!